With the evolution of individuality on today’s weddings, it’s fascinating to see the continual creative energy, tapering each wedding to reflect a given couple’s personality through both the planning process and the illustrated details at the event. As some couples paddle away from tradition, tailoring their wedding with unusual and whimsical ideas, these un-commonalities provide a platform for others in their planning processes. This brings me to bridal belts, a beautiful accessory in a broad range of fashions, being modeled on both runways from high-end designers as well as indie designers in their boutique shoppes. 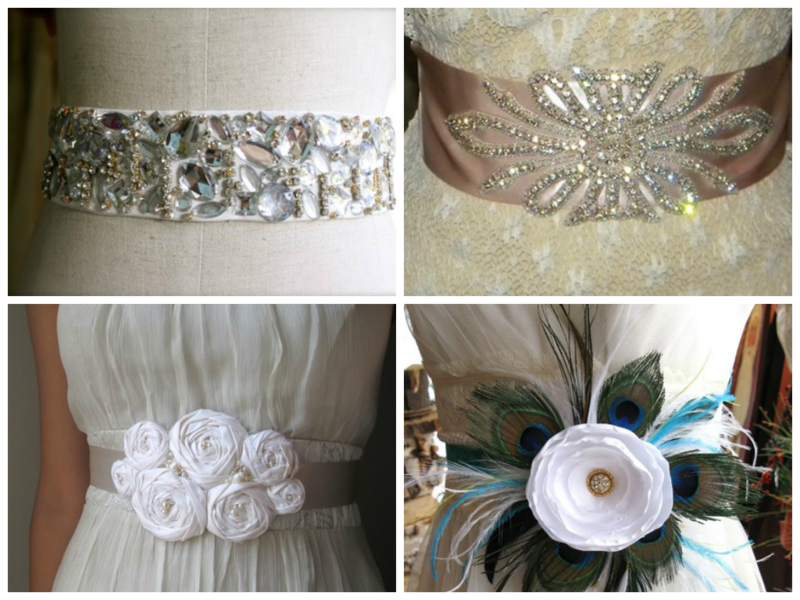 Some brides are wearing simple, dainty bridal belts over their gowns, adding a splash of color to an otherwise traditional dress, a touch of sparkle with gemstone-laced belts, or more bold- vividly constructed belts with things like peacock feathers, vintage trinkets and three-dimensional, hand-crafted flowers. Many brides are adding this modern element to their gown for the duration of their ceremony, whereas others have implemented it only during the reception and for the classic post-ceremony photo shoots, dissolving some of the formality with the elegance of the bridal gown itself and adding something playful, light-hearted and a little whimsy. Some designers, like Simone Carvalli, have bridal belts this season and innumerable boutiques have entire lines of colorful, ornate belts that are certain to perfect your wedding day attire. Try Etsy to search hundreds of indie designers’ boutiques- some are made-to-order and others can be discovered by keyword (consider words like: floral, gemstones, Swarovski, ribbon, lace, vintage, trinkets, charming, colorful, antique, etc. ).